I have a crew of guys building a dried-in garage shell for me, detached from my house. There is a large pile of topsoil and my compost pile and garden behind the garage. Last week they noticed a couple of small rats scavenging out of the compost pile. I have never seen rats before around my property and I am not happy. What can I do to eliminate them? I do not have a dog and my cat is useless. There was a fox in the area but it was killed by a neighbor's dog last week. I don't care what it takes, I can't deal with rats. I am certain they are not in the house or my shed, but I feel it will only be a matter of time before they invade. I haven't seen them in the past few days since the weather got cold. I thought I had chipmunks in my truck body shed so i set a water trap like Jeff did in the "Don't tell PETA" thread. Ended up taking out a HUGE rat. 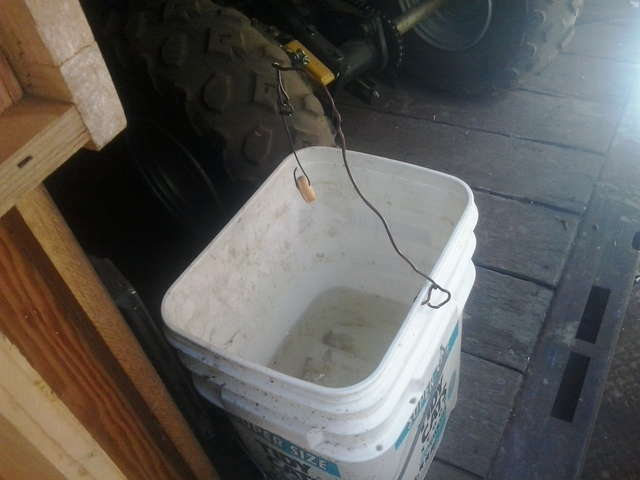 That is a Ritz Bits peanut cracker stuck on some wire over a bucket half full of water. Take away there food, bird seed or what ever and there leave there there because theres food somewhere close. Try D-con. Keep putting more out untill they stop eating it. Wait for a rainy day and they will all be laying in your yard dead. They multiply real fast and you never have just 1. Wood rats are all over the North East. Only problem with poison is where they go to die. Not my experience, but I do know about it, and it aint pretty The car got sold!! I've found over the years that they go back to where they are "living" to die. Be it the house walls, or the car. It is why I try to maintain a regimen of putting out poison while they are looking for a place to stay, not after they already found that place. Then I don't have any moldering bodies that stink.. The fall of the year is an important time to put out poison, and just enough that they don't just hoard it and stockpile it for later. Let them haul it away, and then try dining on it right away. Rats need three things to thrive. Deny them any one of these things, and they will be a transitory nuisance at the worst. From what you are describing, it seems like a prime situation to put out some bait boxes with poison blocks. The poison blocks you put in the bait station work very well on rats, because unlike almost all other mammals, rats can't "throw up". So the poison has an epicack in it. This helps lower the toxicity and lethal effects to any dogs, cats or other mammals that might accidentally ingest it. In many environments, you are never going to be able to fully eliminate rodent populations, because of their access to food and water, (and their high reproduction rate). What you can do is to keep their numbers at a more manageable level. I never had a problem here at my house until earlier this year when I started my flock of chickens. Now I have open sources of both water and food, and started seeing some rats hanging around the chicken coop. So I had to put out a couple of bait boxes to keep them at a manageable level. I'll never eliminate them completely, but so long as their numbers stay down, they shouldn't cause too many problems. A while back I got something off of Amazon called a "rat zapper", think of it as the electric chair for rodents. I use mine for mice and it's awesome. A while back a friend used it to dispatch a red squirrel living in his house. Every few years I have 2 or 3 pack rats (AKA wood rats) move into my garage. I tried setting out a conventional spring type rat trap but it never seemed to work. They would trigger the trap, get out of the way, and then go back and eat the bait . So I cut a piece of 1x8 about 16" long, and screwed down two rat traps end to end, so the bait end of the traps were closest. I figured when the rat triggered one trap, it would jump back onto the other one. Man, did that ever work. I'd go out the next day and I'd find both traps sprung and the dead rat caught in one of them . I do not like rats either. Have a rat shoot! It is very therapeutic and tops all discussions of "gun control". You have to control the gun well to hit the rat. Pellet guns or .22's are perfect. If anything is around that you have to be careful of, just use rat shot in .22. If this does not work, then I would definitely use poison. As a matter of fact I would do both. Once they get started they go nuts. I had them at my compost pile 2 years ago. I poisoned them with those little green poison balls from the feed store, and I have gone from seeing 5 or 6 around the compost box to zero for 2 years. I use basically the same kind of trap as John, except that I use about 5-6 inches of used motor oil! That way it won't freeze. One trap in the garage and one trap in the cellar! I quit using pellet type poison after finding it in tractor air filters and in the riding mowers, now I get the little blocks that have a hole in them, use a short piece of lumber and some 3" deck screws to hold the poison blocks in place so they can't haul it off to store. I usually put 2 blocks on a 8" long wood scrap and put it where the dog can't get reach. I don't know if you have any type of FEL for turning your compost but if you do that and a 410 shotgun makes for some good entertainment . We get them around old silage piles, that was always my method, now dad has cats that seem to multiply like the rats did, haven't seen any rats or mice for years. On this place we have weasels and thus very few mice and no rats, but something we learned along the way was to attach the poison block to something so that they cannot pack it away. They eat it at bait site. This also allowed us to see just how much was being eaten and an indicator of how many we had around. Alberta is considered to be "rat free" and when we lived near the border the "rat man" from Alberta came around as he wanted 30 miles of SK to be patrolled so that he could keep Alberta cleaner. The amount of science that fellow had put into rat control was amazing and he was very successful. He was welcome on any farm he showed up at! "The early bird may get the worm but the second mouse gets the cheese"
I agree with the used engine oil. Put some in a 5 gal. bucket and it's like a magnet for them. Then you don't have to worry about the poison issues and they don't stink. D4D caterpillar, lt10 Woodmizer, 8x12 solar kiln, enough Stihl's to make my garages smell like their factory Ohh and built Ford tough baby! ...There was a fox in the area but it was killed by a neighbor's dog last week. Just let the neighbor's dog kill the rats.